In 2011, Lady Gaga released the song “Born This Way,” as an empowering song for women and the gay community. Seeing as March is Gender Equality Month, it seems appropriate to return to her anthem of empowerment while highlighting agencies that offer LGBT youth resources and support in what may be an otherwise trying and difficult time. Since we’re already on the topic of Lady Gaga, let’s start with her organization Born This Way Foundation. Started in 2012 by Lady Gaga and her mom, Cynthia Germanotta, the foundation focuses on research, learning, and development of new programs to support their original mission: connecting young people in safe ways and empowering them with the skills and opportunities that will inspire them to create a kinder and braver world. They do this by showcasing real people and their stories, quality research and authentic partnerships. Lady Gaga focuses on kindness and feels that it is key to building a more accepting world. One way she is doing this is the Cities of Kindness which was started on June 26, 2016. On that day, she met with Phil Anschutz and His Holiness the Dalai Lama to address more than 200 mayors. They were there to discuss how kindness can help to improve the mental health of citizens and also lead to a decrease in crime. These Cities of Kindness are happening all over the country where mayors are uniting community leaders, activists and youth to bring positive changes. The Born This Way website is filled with resources for people to find support, get help, and learn how to take care of themselves. It also gives visitors the ability to share their story and highlights other ways that we can spread kindness every day. True Colors Fund was started by Cyndi Lauper and is “working to end homelessness among lesbian, gay, bisexual and transgender youth, creating a world in which young people can be their true selves.” They focus on advocacy, training & education and youth collaboration programs to end homelessness in the LGBT population; LGBT youth make up over 40% of the homeless youth population but only 7% of the youth population. 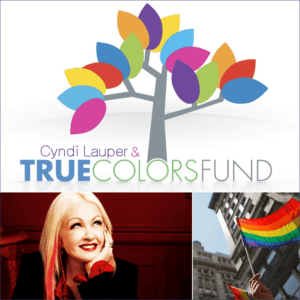 The True Colors Fund has several youth collaboration projects that are focused on helping LGBT youth to develop necessary skills to either add to the work being done or to become an active member in part of the solution. True Connect, which will be an app for youth to have access to the resources available to them in their area through the True Inclusion Directory which is also available on the website. True Fellowship which allows for young people to perform a 6-month community project that they have developed and implemented themselves with the assistance of someone at True Colors and True Opportunities. True Opportunities is in collaboration with corporate programs to give LGBT youth the opportunity to learn about careers in the corporate world. True Colors has also been instrumental in working with legislation in Washington D.C. and on a state level to ensure that all youth but particularly LGBT youth no longer face discrimination while trying to access necessary services in order to survive and thrive. In doing this, they have formed coalitions with the National Network for Youth, the Department of Education, Office of Juvenile Justice and Delinquency Prevention, Department of Health and Human Services and Department of Labor. One of the programs CenterLink has is called YouthLink, which aims to bring a youth into the discussion on policy issues on a national level. YouthLink also provides support and resources to center directors, youth program directors, and youth programming staff by providing training, resources and technical assistance. They also work to bring more attention to the issues that LGBT youth face by providing a safe space for them to discuss these issues, present policies they’d like to see and coordinate with advocates to have them incorporated. One final organization is the Trevor Project. Trevor Project was founded by the creators of TREVOR, an Academy Award winning short film. They provide crisis intervention and suicide prevention for LGBTQ youth aged 13-24; their number is 1-866-488-7386. Have instant messaging and texting available. Provide Community resources for youth. The community resources are aimed to connect youth to help them build social supports but also to provide advocacy, raise awareness about issues affecting the LGBTQ community and to improve legislation affecting LGBTQ youth. Remember, you deserve to be heard and by calling us here at the National Runaway Safeline or by reaching out to any of these above organizations, someone will be there to help you. The organizations I’ve talked about here are only a few of the ones available and they are dedicated to helping you feel safe.